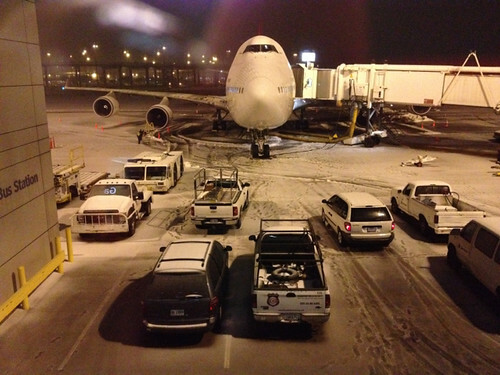 We're home after our month in Mexico - a day later than scheduled, thanks to an unexpected ice-storm that left us stranded in Dallas for more than twenty-four hours. I'm finding it difficult to round out the tale of my time in Mexico. I'm almost too tired, too full of what I've seen, and too sad about what I've missed to be coherent. With this trip I've really had to face up to the fact that I'm unable physically to manage what once I would have taken for granted. But, tired as I am, I want to capture the remainder of my Mexican trip before places become too scrambled in my mind. 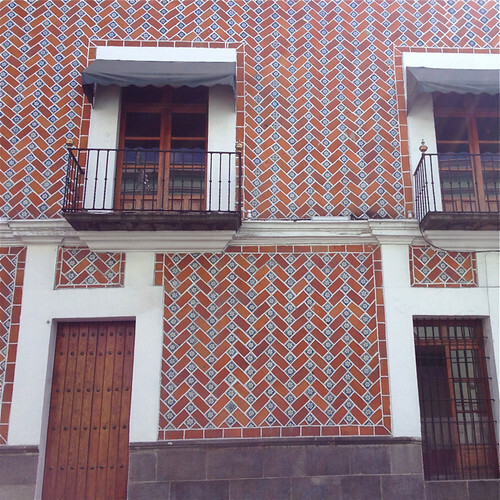 We visited Puebla - a grand colonial city a couple of hours south of Mexico City. 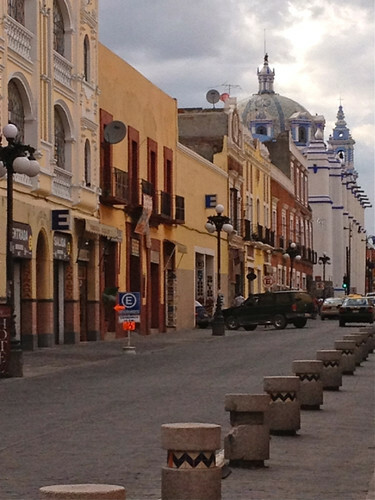 Puebla was settled by the Spaniards in the 1531, and the planned gridded streets, elaborate, florid public buildings, decorated churches and colonnaded central plaza all reflect the status and wealth of Puebla during the colonial period. 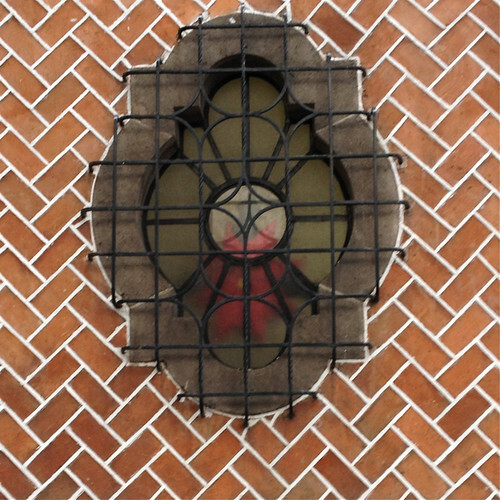 I particularly like the highly decorated surfaces of some of the grander buildings - especially those that intersperse decorative brickwork with local patterned tiles. It seems that too much decoration is never enough. 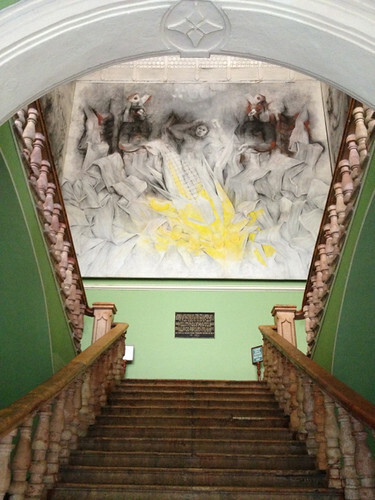 Unfortunately, photographs were banned at what, for me, was the highlight of our visit to Puebla. 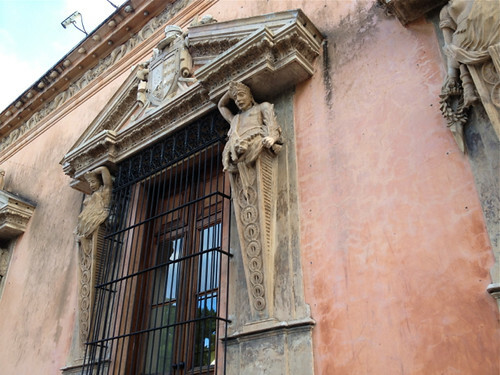 The Biblioteca Palafoxiana is the oldest public library in colonial Mexico. It was established in 1646 and the beautiful space in which it is still housed was built in 1733. 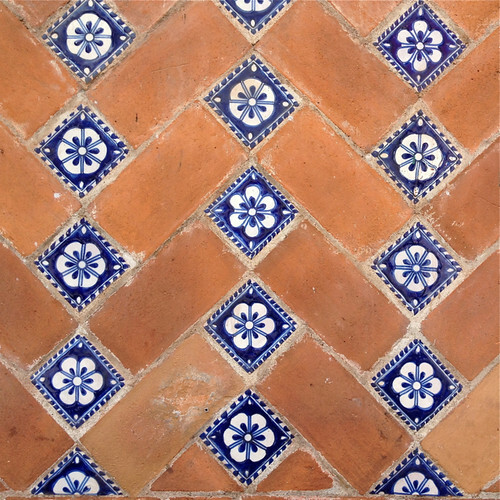 There's a long, vaulted room with a worn floor of warm, rust-coloured tiles interspersed with blue and white patterned tiles. The mainly Latin language collection is housed in a double row of beautiful shelves with walkways for accessibility. Sometimes in the Western (northern? )world we can be very arrogant about the achievements of today's societies. One of the delights of travel is to be reminded of past successes. 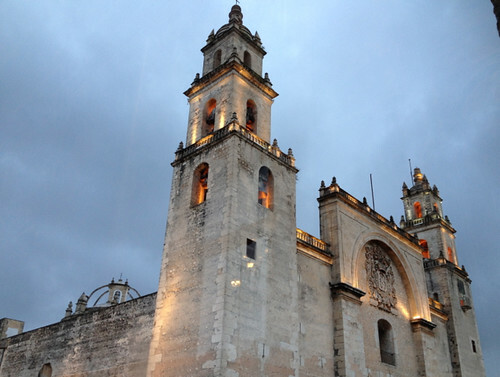 We visited Merida, another of the grand colonial cities of Mexico, further to the east and the capital of Yucatan state. 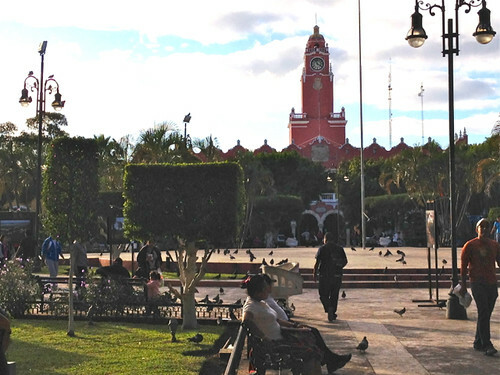 I love cities that have a grand central plaza - a zocalo. It provides a heart for the city. All the cities we'd so far visited - Mexico City, Oaxaca, and Puebla have grand zocalos; places for meeting up, for public celebrations, for drinking a leisurely coffee, and, most importantly, for strolling or making a paseo in the evenings. 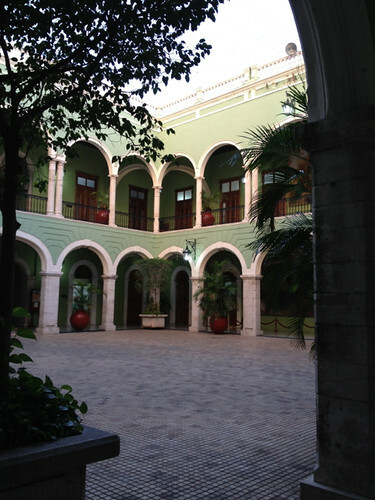 I particularly liked the Plaza Grande in Merida which had all these characteristics, but also offered insights to both the history and current culture of Merida. On one side of the Merida zocalo is the 1598 Catedral de San Ildefonso, more bulky and less decorated than the cathedrals of Oaxaca and Puebla, but probably more imposing as a consequence. I loved the combination of austerity and decoration in this building, and can think of no more perfect patina than the weathered soft pink of its walls. 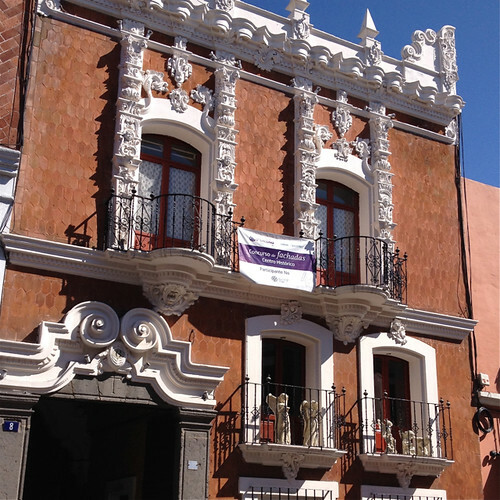 The building is now maintained by a bank that has its premises inside, but the bank has also impeccably restored the front rooms of the Casa de Montoya as they would have been in the late nineteenth century. 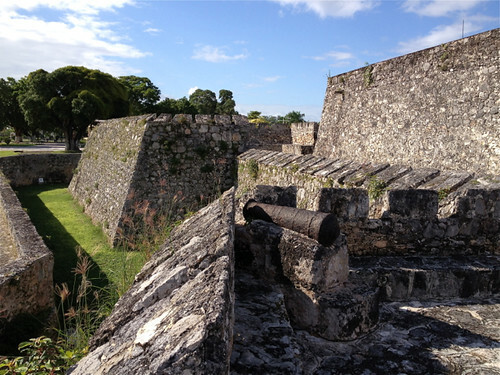 With one short visit you can imagine both the impact that Spanish colonisation must have had on the Mayan population in the mid-sixteenth century, and its continuity as an elite well into the nineteenth and twentieth centuries. On a third side of the zocalo is the late nineteenth century Palacio de Gobierno, currently painted pistachio green. 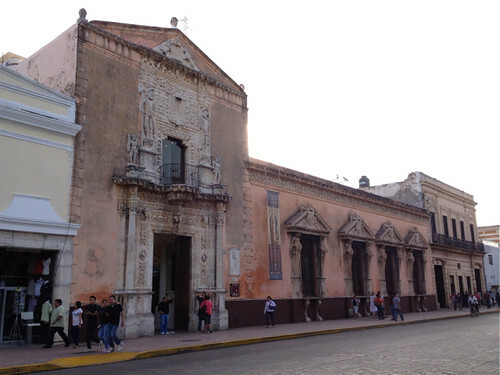 If you persist past the well-guarded entrance you discover a beautifully proportioned colonnaded building from which modern Merida is administered. What I hadn't anticipated, though maybe I should have, given the importance of the muralismo movement in Mexican art and history, was the series of 1970s murals depicting the history of Merida - with a particular focus on its Mayan foundation myths and the often troubled and confrontational relations between the colonisers and the Mayan inhabitants. 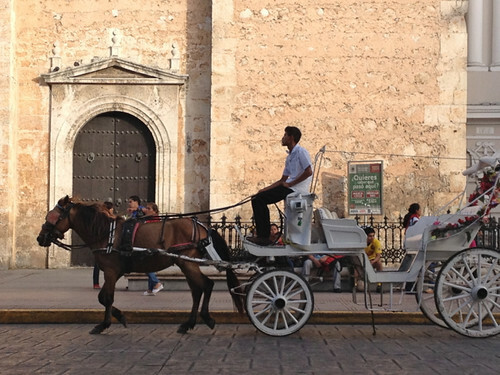 You can take a paseo around the central square and become aware of the grandeur and diversity of Mexican history. But the zocalo still has a role in people's daily lives. On the evening we arrived we went in urgent search of food and happened upon large numbers of people dancing to a salsa group in one of the streets that border the plaza. Old people, young people, couples, individuals. We were too hungry to linger but it was a good introduction to Merida's zocalo. Later we were told that the whole plaza has free wifi, and that there is a scheme that enables people to borrow laptops to use within the space. I imagine there must be learned studies of the significance of the zocalo in people's lives, but even to the casual tourist observer it seems to be a most humanising space. We visited Chetumal, the capital of the state of Quintana Roo, in the south of the Yucatan Peninsula, on the border with Belize. 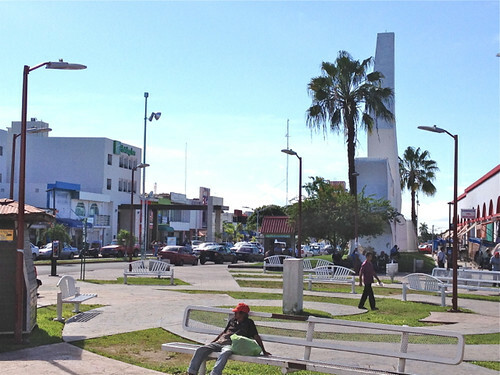 Chetumal is definitely not one of the beautiful colonial cities of Mexico; in fact, the city was officially founded by the military as late as 1898, to protect the border that, after many years of disagreement, had finally been decided between Mexico and Great Britain. The small city has an air of practicality about it. Internal immigration from other areas of Mexico is encouraged and there's the low-key bustle of people getting on with their daily lives. If you look, there's evidence of the Mayan character of the city and surrounding area. 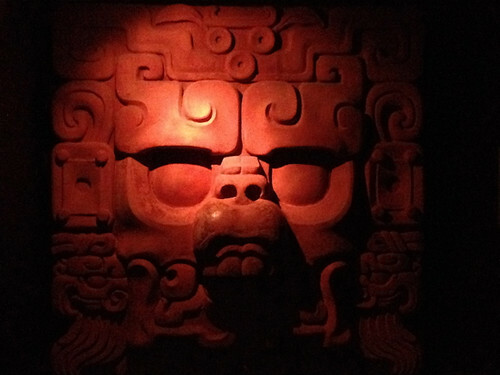 There's a small but well-displayed Museum of Mayan Culture where a dimly-lit recreation of the Mayan version of an underworld afterlife had Ana Maria enjoyably horrified. There are a few reminders that the area around Chetumal is not only Mayan, but linked to the Caribbean. There are still occasional timber cottages in Chetumal - reminders of the British influence that was much disputed in this area in the eighteenth and nineteenth century. Just outside of Chetumal is Laguna de Bacalar, a large lake that, together with the Rio Hondo, provided access to the interior of the region for traders, settlers and even privateers and pirates. There's a small fort dating from 1733 that's been recently restored and reminds the visitor of the turbulent eighteenth century history of this region with conflict over territory between the major sea-going nations of the world. [My well-travelled grand-daughter was rather disappointed by the fort, comparing it unfavourably with the Castillo del Moro in Santiago de Cuba]. And finally, we visited Cancun to begin what turned out to be our challenging trip home to Australia. Such a contrast with so much we had seen. 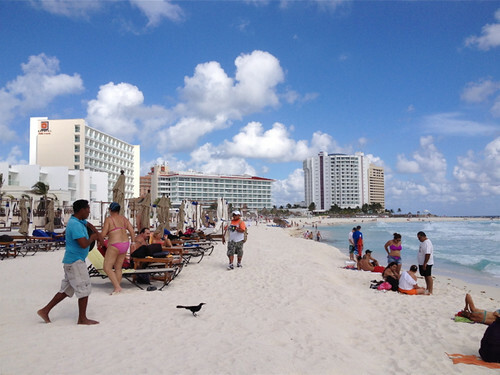 Cancun dates only from the mid-seventies, and if you focus only on the resorts and beaches and international hotels, you could be almost anywhere in the world. I certainly know much more about Mexico now than I did before this trip. I'm pleased we were able to visit different places with different histories and cultures. 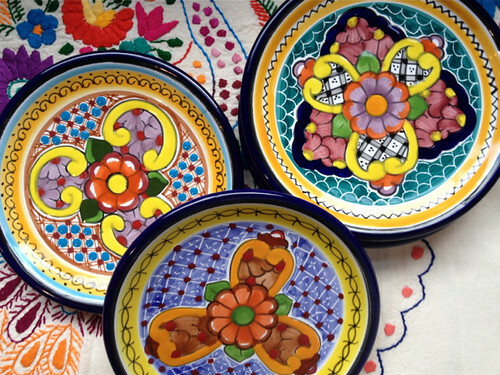 I'm impressed by the strength of Mexican identity and by both the 'official' and everyday ways that local and national identities are interlinked and enriched. I feel there is still so much to see and learn. If you grow up in a country that's also an island, especially if it's as big as Australia, crossing a border is a big deal. You have to make a special journey, either by plane of boat, to make a border crossing. So the idea of going to another country for lunch was astounding for 6 year old Ana Maria, and still had a certain frisson for me at more than eleven times Ana Maria's age. 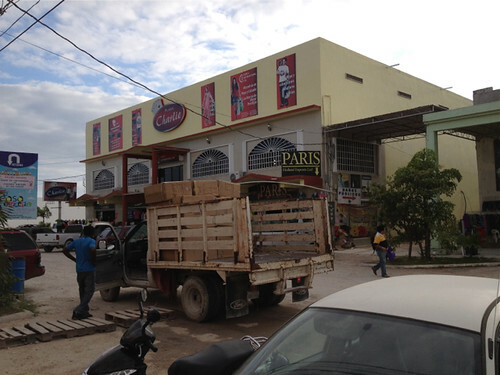 We're in Chetumal, in the state of Quintana Roo in the far south-eastern tip of Mexico, right on the border with Belize. 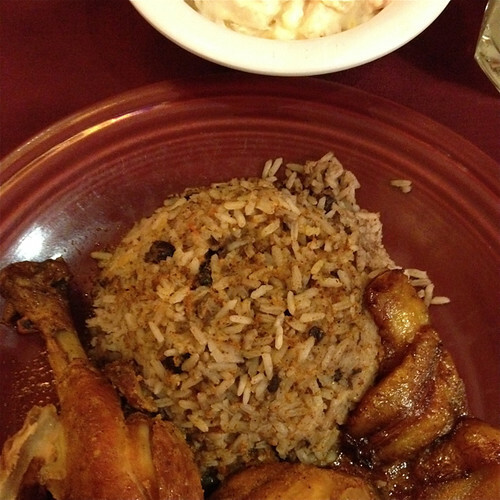 A friend of my daughter offered to drive us across the border to Belize for lunch of rice and beans. 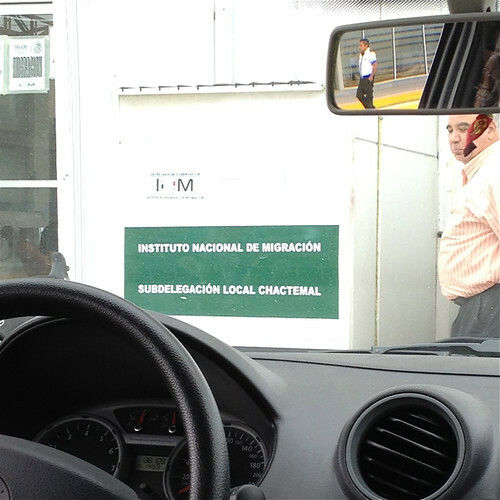 The border crossing hardly lived up to our expectations. We were simply waved through the border by immigration officials - no need to present identification and, sadly, no stamps in our passports. 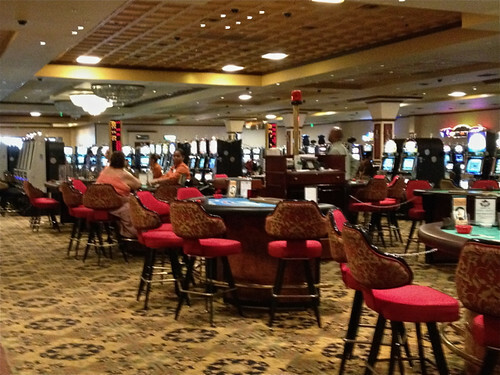 The casino itself could have been anywhere in the world, though our rice and beans with plantains, chicken and potato salad were distinctively and wonderfully Caribbean and we were served by English-speaking waiters in the only (officially) English-speaking country in central and south America. So we crossed the border for lunch and found a mixture of the local (the food) and a strangely borderless world.